BetKing, the popular Bitcoin gambling site known for its high payout dice game has just announced it will be opening its doors once again, but with a new and improved platform. 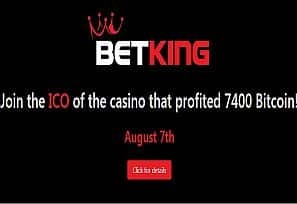 The official launch date is set for this September 4th, prior to which BetKing will be running an ICO (initial coin offering) campaign to support the re-opening of the popular gambling site. The campaign will begin August 7th and it will last until the launch date. BetKing was first launched in the spring of 2013 with the help of another crowd-funding campaign. Not long after its launch it became a very popular Bitcoin gambling site for dice players, thanks to the high betting limits it offered to its users. One notable milestone BetKing achieved was becoming the best crowdfunded gambling site in terms of wagering volume, which was estimated to be around 400,000 Bitcoin from 2015 and onwards. The site originally launched with a bankroll of 6,000 BTC , which was gathered through the ICO, and all of the funds were returned back to investors when it shut down its doors in 2016. According to BetKing’s numbers, the casino profited 7,400 Bitcoins during its run, which likely leaves around 1,400 for the management and owners. Before it closed down, the casino announced they will be introducing new features, only to reveal a couple of months later they are shutting doors to prepare for a re-launch. The new platform will bring several improvements over the old site, including the introduction of updated versions of provably fair games like Roulette and Blackjack, as well as poker games, tournaments, and sports betting. BetKing will also be giving casino websites a chance to “integrate” with their platform, while they take care of the fund management, security issues, and player accounts. One notable change the new site will introduce is that BetKing will no longer be just a Bitcoin gambling site, as the re-vamped platform will also integrate Litecoin, Ethereum, and other currencies in it. The casino says that there will also be new social features introduced to the site that will be revealed next month, when players will be able to test them out on BetKing’s beta platform along with all other new features. During the ICO campaign, BetKing will issue 100,000,000 BankRoll Tokens, 70 million of which will be up for sale to participants of the crowdsale. The remaining 30 million will be kept by the casino for expenses like advisory fees and testing, marketing, and hiring purposes, among other things. Around 50% of the gathered funds will be reserved for the bankroll, which the casino will use to pay out players and generate profits. A percentage of this profit will then be gradually used to buy back the Tokens from funders, as it was reportedly done in the past. If you get in on the deal early, you will be able to get discounts of 15% during the first week, 10% during the second week, and 5% during the third week, starting August 7th. For more info on what the asking price and buyout price of each token would be, you can check out BetKing.io.